Julia Rios writes all sorts of things, hosts the Outer Alliance Podcast (celebrating QUILTBAG speculative fiction), and is one of the three fiction editors at Strange Horizons. Her fiction, articles, interviews, and poetry have appeared in Daily Science Fiction, Apex Magazine, Stone Telling, Jabberwocky, and several other places. She’s half-Mexican, but her (fairly dreadful) French is better than her Spanish. I’ve always been interested in promoting diversity in the SF field. I’m a bisexual woman of color, so in some ways, that’s a purely selfish drive. I want to see myself reflected in the stories I read. But it’s not limited to that; I also want everyone else to have the chance to see themselves, and I want to see stories about people who aren’t like me. This is why I am so excited about the book I am co-editing with Alisa Krasnostein. Kaleidoscope is an anthology of diverse contemporary YA SF and fantasy stories. Our crowdfunding campaign ends in just under a week, and if we reach our funding goal, we’ll be able to get started on putting the book together. Of course, that’s a bit disingenuous–we’ve been working on this for over a year already. In the winter of 2012, while she was doing errands in Western Australia, Alisa was listening to an episode of the Outer Alliance Podcast (which I host). It was a panel discussion about the lack of QUILTBAG characters in YA dystopian novels, and it made her wish there were more YA stories with QUILTBAG characters. She’s a World Fantasy Award-winning publisher, so she didn’t just sit there wishing in silence. Later that day, she e-mailed me. I read the message on a hot summer day in Massachusetts, and so our time and season-crossing collaboration began. Since then we’ve had many Skype calls from one side of the world to the other, each of us getting up early or staying up late to be available to the other. Of course, as fans of the Coode Street Podcast will know, that’s hardly unheard of in the SF community. One of the coolest things about living right now is being able to have this sort of long distance working relationship. I don’t know how we could have done it 30 years ago. The world seems smaller now, somehow, and that’s one of the things we hope to show in Kaleidoscope. We want to share stories featuring all kinds of people with very different perspectives and lives, right next to each other in one book where the common threads are modern day teens, and science fiction and fantasy elements. We started out just thinking we wanted contemporary fantasy. We settled on that because we wanted stories that felt recognizably modern, not set in a different world, or in the distant past, or far in the future. 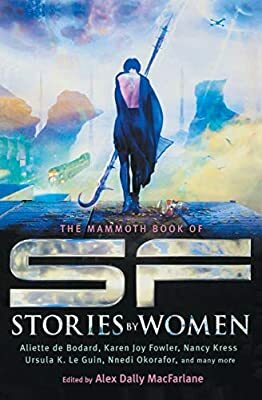 We acquired wonderful stories by Sofia Samatar, Ken Liu, Vylar Kaftan, and Jim Hines. These stories are beautiful, fun, heartbreaking, and adventurous. We love them all, and we can’t wait to share them with you. Genre-wise, we thought we’d picked contemporary fantasy and that was that, until we had the sudden realization that science fiction can be contemporary, too. We believe in allowing for growth and change, so when this hit us, in the middle of our fundraising campaign, we rolled with it. We announced just the other day that we’re also open science fiction. We even bought another story to prove it. Our first SF piece is by Sean Williams. It involves teleportation and urban legends, and it is awesome. We’re not limiting this book to authors who have already established themselves in the field, though. We’re also reaching out to anyone anywhere who might have a story to share. Our full guidelines will be posted on the Kaleidoscope website as soon as we have $7,000 in pledges, but I can tell you right now that we look forward to reading all your stories featuring modern teens who are people of color, neurodiverse, mentally ill, disabled, from non-western cultures, and QUILTBAG identified. We want to delight in their adventures, be awed by their magic, and geek out over their tech. If you’re a writer, or know someone else who is, spread the word about our call. If you’re a reader, like us, and if you want to see these stories for yourself, please back Kaleidoscope today! I support the goals and mission of Kaleidoscope and hope it will be funded.